Time is plastic. Our linear measure is man made for convenience. The oversimplification of minutes, hours, days is functional in a base utilitarian sense, yes, but fails to account for point of entry, context, point of view, the density of what is occurring in time and how it is thus experienced. Time is geometric; it also has the experiential component and this has height, width, variation and forms from point of view and processes differently with each individual. An event in time thus is not only to be measured in its variable detail, but also of its place in time. This is not a time-line. An event in time is a collection of many smaller moments coalesced into measure. It is composed of factors, facts, contexts, scope, details and duration. An event begins, an event ends, but its true measure is not that simple, nor should it be; time is not to be caught and cleaned on a hook like a fish, nor is an event in time just a sequence of moments with a beginning and end. It is more akin to a cumulus, that puff of cotton cloud of so many paintings and postcards, for it also is something of a single form, yes, but much more. A cumulus has an average life span of 15 minutes. It is actually composed of several smaller sections rising and falling, coalescing or evaporating along its lifespan. The cloud is in segments that make the whole and within those segments are smaller segments and components the further in you look and measure. Such is time. 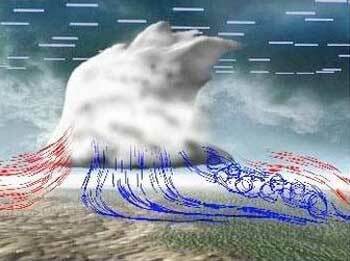 There also are contradictions and variations in that cloud that are not visible such as air currents, shear, packets of heating from the earth up in their life spans and most immediately important, there are smaller forms arising along its surface, hence the cauliflower like appearance. Such also is time. The smaller forms along the surface of the cloud are along its ridges in smaller and variable forms that rise and fall in complex patterns. This is a strong analog to a true measure of an event in time and its components to the whole and various rises and falls at once. Another interesting comparison of an event in time is to a mountain range and its variable shapes, but also its topography. 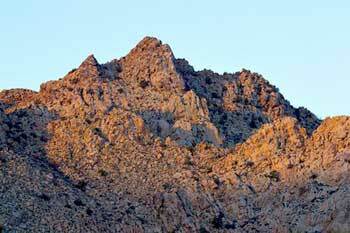 A mountain range has various elevations but also has patterns of individual ridge and crests that are along the surface. The mountain can be placed on a map and seen at a distance as a whole, but it also is shaped by and can be measured by its topography or even deeper as the algorithmic patterns within its shapes and variant elevations (data variations in a whole). As an example there is a topography or cloud-like shape to the measure of a day in the stock market with a stock over time. Several stocks over time will rise and fall at different rates and highs and lows over that same day and yet each can be seen as a pattern in a larger whole, hence an event in time is composed of components and they shift in time and it has a shape. The general and overall shape or form is the overview; the smaller components are divided in time across that day and the small ridge pulses along the line are what form along the measure in individual spikes and pulses along the way. This commonality thus clearly can be seen in other forms of measure in nature and data as well and is indicative of a need for a different sort of model and sense of measure to better calibrate and utilize this form and flux. An event in time is that cumulus, it is that mountain range, it is not a time line or chart. It is geometric by its very nature and is definitely not flat. It is a whole, it is segments, it is individual rises and falls of several parts at once at different rates and intervals. Why not measure it as such? What if a time line could be something that was full of information not just points and markers, and that one could see this visually in the depth of the time line forming a geometric shape that changed as one moved through the info and grew or shrank in correlation to what happened at that point in time and could cast a sort of shadow or figure over the viewer? The weight of war could become a shadow and the growth became undeniable as one saw the rising death toll like its numbers and time were not only made viscerally immediate and full of triggered layered experiences but the weight of the measure itself could be felt? the passage of time into turned out to be a deeper immersion into war and some passive line or numbers but the moments and things lost or destroyed were brought into immediate experience along with the weight of what was building in time’s progression, sinking the viewer in. The calibration of the war dead and such data is only a number; it is clinical, muted, clipped of the deeper emotions, of the visceral. A number is a calibration, a blunt icy measure in the face of what may be being measured. Imagine moving through a space and seeing a shadow being cast ever deeper on you as a shape towers ever higher above? What if this is the number of dead in a week of a war? The weight is almost tangible with the growing, looming number rising ever higher in time. This is also geometric and is not a figure isolated or a simple time line. An event can be felt in its measure in a way imbued with a sense of humanity, or crisis, or urgency for attention in this new model. Therefore, time transforms into a three dimensional and multi-faceted experience. What if the information is instead data in a span of time but also conveys what is experienced in time and space and that can alter as one moves and chooses? A verticality of time could be measured, in a sense, in its depth and one could experience the ebb, rise and dissipations or spasms of a period or event in time: its turbulence, its squalls of activity, of what is usually laid out horizontally like a map; one walks through a space but also a time-line of sorts that could correlate to the space…..
A true “time line” would be one that is composed of the various aspects and components of an event in time, and mapped as to how they rose and fell at varying rates within the scope or shape of the event itself in terms of length. The example earlier of stocks in a day is a good starting point. What would be the shape of the days events with each stock colored and coded from beginning of the day to the end? Wouldn’t it be a topography of varying rises and falls like the different hilltops within a specific mountain range? More importantly, wouldn’t the same be true of a week in the war in Iraq or in a historic event? In a sense, event time is convective. A shape of the information within an event in time is quite layered and is about several shifts and changes in information at any moment as well creating the sense of accumulation(and thus perspective both literally and in interpretation) over time. A different measure is possible and it can incorporate these factors and their rich ore of possibility. 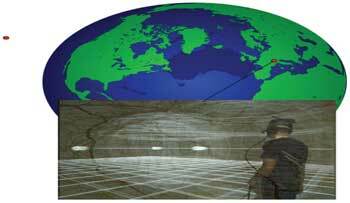 Imagine a 3d interactive globe that you can access. On the globe are hot spot markers that appear as dots around the world. You zoom in to one and by powers of ten type zoom come to a map of a section of a city. On that map are two 3d sort of worm shapes. You click on one and have the option of either seeing an on-screen ( computer, phone or pda) play button that runs an intro screen with a set map icons explaining what factors are being looked at in the event mapped. 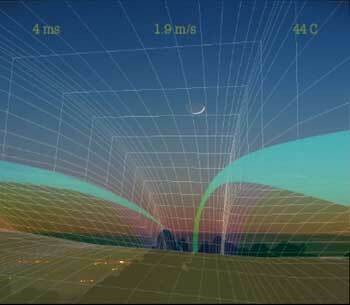 In this option you click play and from a first person perspective or a zoom out to the sides or above an event in time unfolds as a journey through a 3d space (within the shape) with time demarcations passing as the walls and variant ceiling forms rising and falling in variant streams as the event runs as a visualization, not just of its key details, but of its shape in time. An event to be experienced in viewing can be coded so each portion is clearly understood as a singular entity as well as a key part of the whole. This take on the code of a map and its icons and makes it immersive as well as interactive and connected to deeper levels of information, analysis and experiential recall or replay in the 3d model. There also can be embedded bundles of more straightforward video, audio or text of footnoted/referenced material as well as documentation of what occurred within that portion of the event and its larger timeline. This can allow a full multimedia experience to be utilized as enhancing the data model if desired. In this new model, a shape on a map zoomed in from the globe is the ultimate shape of the data of the event in terms of its scope, breadth, sections, selected aspects/variables and how they varied in time. This is not a timeline. The model allows analysis and experience of the rises and falls and shifts that is far beyond just data and its cold measure. Immersive Event Time is a new method that allows a greater depth of information, analysis and measure to emerge in a modeling of an event in time that also confronts the literal shape of an event in time and its interior complexities. It also can be a new method of global communication and education as the map and globe can be the simple base for this new layer of analysis and intervention as more projects emerge. Historians can create 3d interactive models of and from their research, commentaries and dissent can be made of specific events in their detail and the places where they took place in tandem. The globe and map thus becomes a platform, a network and is thus radically recontextualized from its semiotics of pure measure but also exclusion and tension into a purely utilitarian space for global communication and interventions. 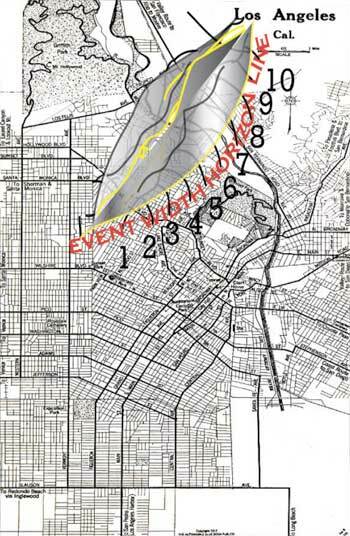 Works can be placed on the specific area of the event and in fact this looks to be the norm or majority as it is a spatial connection to an event and commentary or record, but some works may be laid out as such to be placed in intentional juxtaposition like Paula Levine’s work overlaying Baghdad on San Francisco. This could make a person jarred both by the overlay of it suddenly in the familiar comfort zone of “home” but also by seeing the tragic details come to life in sound, narratives and/or images and seeing and experiencing a rise or spike in violence and death as one moves through a time line of the war and to see and feel the heightening morass as through growing skyward around one as they walk through the time line of its events. Another work completed on this software may be more straightforward historical analysis from the various branches of historical research completed either by an author completing a body of work, or by a professor and students in various fields. Works also can be political interventions, commentaries and actions to raise awareness of what took place on a location in time that otherwise may be distorted, downplayed, spun against or ignored. This also creates an even deeper model possible of global interaction in terms of working with shared models and research on a global platform (literally) and of dissent finding community world wide and voice as the basic software will be free to download and the model will run on the net and other platforms. The key commonality that ties these concepts even in the non specifically locative visualizations (on-line) tightly back to locative media even in the non GPS run models of the visualization is that all will be clear spatial interactions and commentaries. The on-line map with a visualization connected to a specific space still relates to many key concepts of locative media: spatial augmentation, location specific data, navigation of data tied to a specific space. The concept of “timeline” is now to be not only moved into deeper nuance and interconnection of multiple facets of an event, but also into its connection to place. A thing to consider in a more abstract sense is that both time and mapping coordinates are man made grid systems created for measure, thus both are quite similar in the sense of being overlays and systems. The mapped/gridded space is to be a platform for its own analysis, deconstruction, contextualizations and voice(s) in this mode. The map will be only a utilitarian base for the layer of interactions and models above which deflates its uglier semiotics and places an interactive space of commentary and deeper analysis above. The user can select what types of data and parts of the whole event to measure in a time span as well as to what type of algorithms they would like from Non-Euclidian Geometry and a visualization that will generate out from data mathematically into form and will shift with point of view/entry as Cartesian points on a grid to a subtler mode for those less mathematically inclined that takes input into individual portions along a time space by width and height from scope and spikes and falls in the measures of what took place in its parts. The collected work of a historian or group of historians can now be placed in the space that the event took place in and in an interactive visualization that not only allows a viewer to “read” it as a multifaceted entity of many parts and flows, but also as an entity in time to return to for multiple visits with each revealing more information. The same can be for the work of artists and/or political commentary or dissent. The inner space of an event in time in measure can be compared to that of being inside a giant whale with the ribs as time and data as it’s breathing, shifting skin. Time in a sense is like the ribs as there are points separated by gaps that make the larger shape with a space between and a skin is overlaid (be it time as a system or mapping as a system ) over these points or coordinates of measure. Like the fanciful old tales of people moving within giant whales, the space of an event in time can be a place to move within to see its parts and their relation to the whole as a sort of “living “ entity. Another metaphor can be of a cave with the walls made of time blending to a ceiling that flows above like different lava flows winding serpentine from the beginning to end in variant curls and bends. One navigates through the cave space in the sense of immersion within a shape or form with edges or walls of varying shape and distance apart and with a ceiling above that also varies in shapes and height from the observer. The ceiling in this case can be static or, more interestingly, can flow with animation along the shapes and forms of each core element measured in the event (in the war example, one section of data streaming above can be blue and be of money spent, a red one arcing higher and higher then leveling to rise again can be injured while a darker colored sharp rising form above can be the casualties). The viewer can select their p.o.v from within the space. One can (like a first person video game interface) select a first person view from within the space and move along inside of it past the time demarcations of sections of what occurred, shift to a view of their avatar in the space in some forms and can have the option to move outside to view the overall shape of the event measurement and then move back in again for deeper comparison of overall to specific in terms of information and components of what took place. This will be optimal for user interactivity and mobility enhancing a deeper analysis of the parts to the whole as well as the details and form of an event in time in different contexts both spatially with shifting p.o.v and contextually in the different scalings of the data (again like the cloud or mountain range in its parts to the whole). This leads to a second type of visualization mode. Using GPS and augmented reality one can journey through the data as an active physical space with live geo-location. Individual AR/LM projects can stand alone but also be part of a global network of spatial interactions thus linking into a larger community as well, creating a system of discourse in new ways. Over time, areas may be dotted with multiple works of different scope, context and from different people thus allowing the landscape and cities both a chance to be “read” in multiple voices as well as multiple sections. This is fascinating and needed. Over time there also may emerge a global sense of AR and LM projects being linked and not so disparate. Events world wide may be interpreted and placed spatially along with spatial analysis and interactions into a larger gestalt of a dialect or dialects of interpretation,augmentation,agitation and questioning the static. This also is very exciting and needed. The globe is actually in essence a social network as the interventions will be placed in a communal interface to experience from all parts of the world. 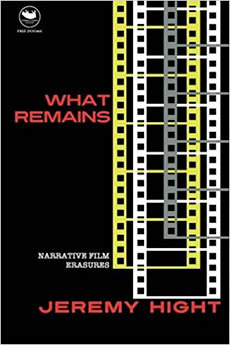 This creates the exciting possibility of inter-linked locative media and locative media as a global communication and linkage as opposed to individual projects isolated as is the norm. The concept of immersive event time time visualizations being on an interactive globe that has dots marking each work if desired by those who created them that can zoom into specific maps and works also allows an interlink of works into a dialog and dialect within both history, critical theory,locative media and augmented reality, education and educational visualizations and beyond. A third and very interesting visualization mode takes the viewer through the event form on-screen as would a first person shooter game with the shape and visualization static. This freedom of movement will allow the person or groups of people logging in from different parts of the world to communicate with each other within the visualization in a more methodical study all the while communicating through text or audio like World of Warcraft or Second Life social space, but within a moment and time and its details. Classes can be held as though within the ribs of a great dinosaur or whale but actually within the space of time and information of what is being studied in class in a fully immersive visualization space. Artists can meet from different countries within a work to discuss it or experience it together and to discuss it. The heights and widths will still vary and there still can be embedded texts, audio and video as well as icons like map icons to explain what each variable is that was measured by the creator or creators of the work/space. Another fascinating possible variation of this form is a realistic visualization of a historic event that replays in its time frame as a realistic scene with embedded demarcations of time intervals/points in time. In this mode viewers can appear and move through the visualization to study it from different points of view, places along its path and even possibly from the documented points of view of persons involved based on different accounts to better study the details and even discrepancies within the event as recorded to attempt to research more information by comparison. An event can recur in its duration in a graphic visualization with time demarcations along its path not only in space but in time elapsed. One could move within a visualization of things wildly varied, ranging from the fall of the Berlin wall with the ability to replay it from different perspectives and from the western or eastern side to the much debated images and time-line captured in the famed Zapruder film to study the various theories and alternate interpretations of history as to who exactly killed JFK. A larger scale visualization could be of a portion of the freedom march during the civil rights movement with different commentary by those who were there based on who you walk beside within it. In one version of this mode there can be multiple people moving through the visualization at once as a community space for research or even for classes to meet and discuss the event and information. This version has many applications in terms of tandem research, a global community interaction within a visualization of an event but within its recreation as well as timeline. Another version of this mode can be only a single visitor/participant that has the added options of slowing the event visualization down and even pausing or rewinding while in the space to review key points. In this mode the community aspect is traded for a greater range of variability and user options in terms of not just moving through the simulation, but in controlling its replay to better study more subtle details. 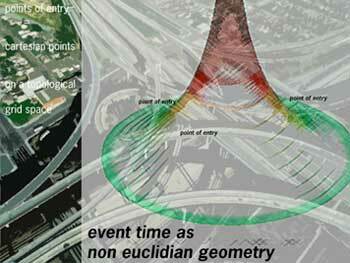 In this mode, the visualization of an event in time and its elements becomes an active place as though an individual or community space on-line, but as a place to analyze, study or experience a spatial intervention, an event in history and to experience another’s work and research simultaneously. This is a potentially fascinating space and hybrid with a myriad of potentials for moving Second Life type spaces into active applications of artistic, historical or political value or even other fields and disciplines. It also can be an interesting study tool as well as mode of global communication and dialog. The need is clear for a more layered and integrated measure of the information of an event in time that moves beyond the limitations of a time-line and takes advantage of the rich possibilities in immersive visualizations, augmented reality,locative media and even video game dynamics of movement,shifting perspective options and interactivity in a space. The applications for historians, artists, political activists and beyond are numerous and deeply prescient. A global model interface that moves to local is an opportunity to introduce a true global reach to data visualizations, locative media and augmented reality as well as interconnectivity of these otherwise disparate to even isolated in a sense projects and a greater collaboration among these practices into a new dialect of communication, analysis and discourse. This is a time when access to layered information and a communication unfiltered by corporate or governmental filters is urgently needed History needs distillation and dissemination: voice,audience, access, discussion. Events need the same and places are increasingly to be “read” but now in an integration of parts into a dialect along the earth and of its places, events and time.